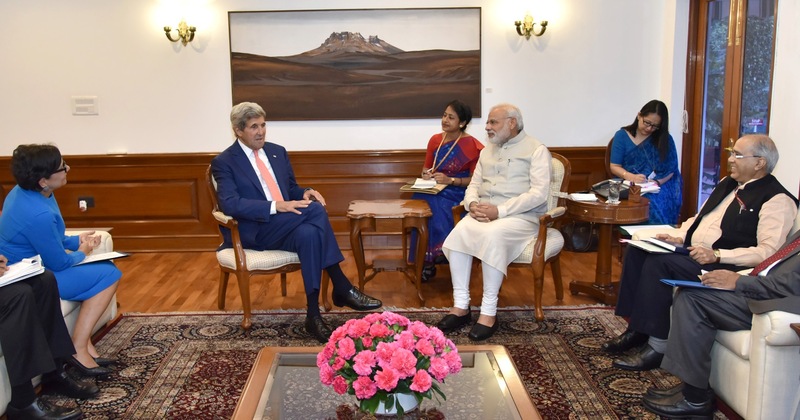 US Secretary of State John Kerry on Wednesday called on Prime Minister Narendra Modi at his residence in New Delhi to take forward the momentum of Indo-US cooperation. Speaking on the Indo-US relationship, the Secretary of State said, in recent years, trade between the two nations has doubled and Washington is now New Delhi’s top export market. He said, both countries worked together in Nepal during the devastating earthquake, evacuated the people trapped in war-torn Yemen and trained peace-keepers in Africa. Talking on India, Kerry said, India is an established power and is playing a crucial role in the world today. He said, India is an essential partner and the US has welcomed its rise. He further said, both countries are the two largest democracies in the world bound with common values of tolerance, equality, respect for religious pluralism and peace. Replying to a query on India’s bid for permanent UNSC seat, Kerry said, there is a way but it is a bit complicated. On Pakistan, Kerry said, it is clear that there is work to do for Pakistan to push harder against sanctuaries of terror. He said, polarization anywhere in the world is not good as it reflects intolerance and frustration. Kerry said, both India and US know the pain of terrorism and it is important to strike at its root cause. He said, security threat is the biggest challenge. Earlier in the day, addressing an interaction programme at IIT Delhi, Kerry said that terror groups and extremism cannot be fought by one nation and all countries have to confront the menace together.